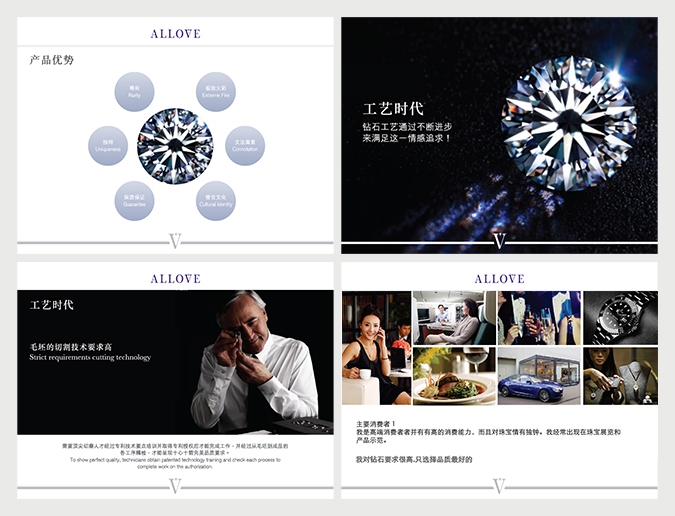 In 2015, XGD, a Shenzhen diamond supplier, sought brand building advice in Hong Kong because they wanted to launch a new diamond brand called ALLOVE in China. A brand consultant with excellent brand building and management experience in the jewellery industry was needed to provide tailor-made services like brand strategy, visual communication and identity design, marketing promotion, etc. ; therefore, they invited Base Creative, and a one-year marketing promotion programme was carried out. Nowadays, ALLOVE is on a steady growth path in the Mainland. Ben Lai, the project director, shares this accomplishment with us. 01 Ben, can you briefly introduce the ALLOVE project? ALLOVE is an interesting project. It’s a whole new brand which focuses on diamonds and its exclusive patent cutting plays a leading role in the global jewellery industry. Base Creative, as one of the leading brand consultants, has served many local and foreign jewellery brands; therefore I hope that we can apply our knowledge and experience into this project and establish ALLOVE as a global brand, starting from China. In order to enter the market successfully and gain brand reputation, we put a lot of resources into developing the brand content and promotion strategy. What’s more, to maintain a smooth and fast workflow, a close project team was set up including members from both Base Creative and ALLOVE, so members can exchange views and ideas frequently and instantly. 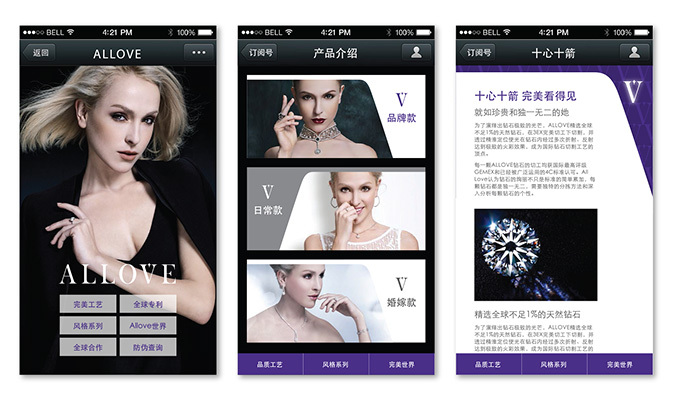 02 Diamond market competition is fierce in China; as a whole new brand, can you elaborate on ALLOVE’s launch strategy? To launch a new brand successfully, no matter in local or foreign markets, we must understand the product itself including its functional benefits, uniqueness and ways of interactivity with customers. An emotional connection of the product which helps customers to know, accept and like the brand, can only be built by knowing the product's value for its customers. Therefore, the first step for a new brand to enter the market is putting its functions and emotional connections together to find out a unique positioning. ALLOVE’s diamond has a strong innate advantage – 10 Hearts and 10 Arrows perfect cut. This exclusive patent cutting technique offers every diamond an incomparable brilliance; that is, more sparkling than other diamonds in the same category. However, such advantage is not enough for ALLOVE to dominate the market instantly. To become a popular and favoured brand, the emotional connection with customers must be built; therefore, we project this technical advantage onto an emotional level, and develop a unique positioning called Perfection on Sight. While other brands advocate Perfection superficially, we are more focused on how to present our diamonds in cuttings which makes our brand more humanized and inspirited. To convey diamonds as an emotional carrier, the brand must be comprised of rich emotions. ALLOVE’s brand story is not only focused on emotional appeal, but also empirical evidence. This is one of the brand advantages. We believe that the core value of a brand should be closely associated with the product characteristics; and this connection has been shown clearly in ALLOVE’s project. The key for ALLOVE to enter the market is how to express this connection through creative design and visual communication. 03 According to the Advertisement Law of China, a brand cannot claim itself as ‘first’, or use absolute words like ‘the strongest’ or ‘the best’ etc. Did this affect the promotion of ALLOVE? In fact, ALLOVE’s diamonds are proven as the most sparkling ones around the world. However, owing to the regulatory constraint, we cannot state this fact. So, we focus on staff training and customers will know this fact when they go shopping. Besides, ALLOVE’s shops are equipped with professional instruments for customers to compare the brightness of different diamonds, giving them a chance to experience how unique ALLOVE’s cutting is. For media promotion, we focus on conveying the emotional value rather than emphasizing ‘the best’ cutting technique because a diamond is not just a piece of stone, it carries rich cultural information and values. We hope that when customers think of ALLOVE, they will feel joy and pride, not only because of the exclusive cutting technique. 04 China has a vast territory and a massive population, so promotion can be difficult. What promotion programmes did Base Creative design for ALLOVE? Our marketing strategy mainly contains 3 steps – first, boost awareness instantly through social media to attract customers’ attention; second, increase the exposure of brand information through trade journals and news to attract readers and arouse their buying desires; third, achieve sales objectives through professional interaction between in-store salespersons and customers. The promotion cost will be very high because ALLOVE will be launched simultaneously within China’s first and second-tier cities. To achieve a broad and effective promotion, we need to ensure the effectiveness of the advertising content; therefore, we constructed advertisement research in different targeted cities to make sure that the content will gain better adaptability across China, in order to raise customers’ awareness. Based on the favourable content, we will gradually implement an O2O (online to offline) promotion programme with extensive coverage in China. We work with different media companies in China to find out the most accessible media channels to reach our target customers; and we analyze each channel’s effectiveness to ensure the effectiveness of all promotional spending is maximized. Besides, ALLOVE has partners which have good retail networks, so we can take advantage of their retail stores for promotion. Salespersons help in promoting the brand where customers do their shopping. Apart from the offline activities, we also put huge resources into online promotion. We created a dynamic content system which can be posted on websites, major social platforms and ALLOVE's official WeChat account, associating our brand with customers’ daily lives. 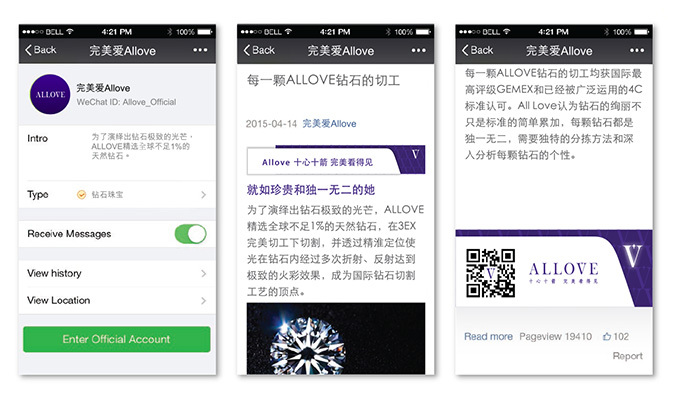 For example, ALLOVE’s official WeChat account has a comprehensive interactive function – a user can get on the platform and easily access the information he/she needs such as diamonds’ verification numbers. Meanwhile, we keep updating our latest brand information and offering promotions to users through mobile phones in order to facilitate consumption. 05 ALLOVE has been launched successfully today, but how will you manage and nurture it in the future? From the startup of this project, we believe that ALLOVE’s diamond will change the global diamond industry owing to having the most sophisticated cut which brings us unprecedented brightness. We believe that all customers will love the brand once they get to know it. 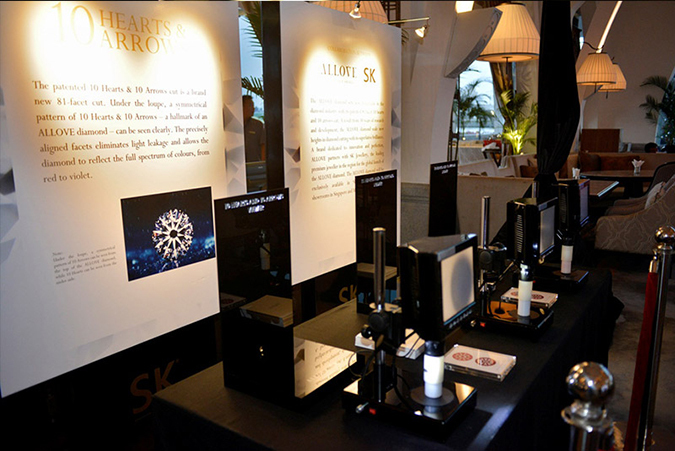 With the accumulation and expansion of brand equity, ALLOVE has the power to become one of the top global diamond brands. To achieve this objective, we have established a 5-year development plan. First, we will consolidate ALLOVE’s brand advantage in China. For the first two years, we will mainly focus on China’s first-tier cities - Shenzhen, Shanghai, Beijing etc. Then we will expand into China’s coastal cities and second-tier cities in both northern and southern parts, forming a triangular geographic bounding; and lastly, expand into the inner part. 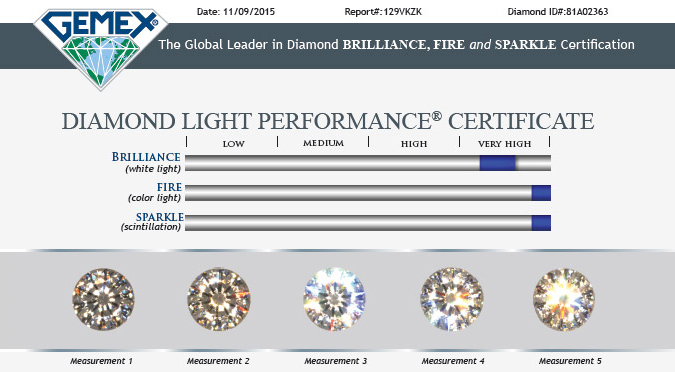 We expect that ALLOVE will become the most popular domestic diamond brand in China with numerous retail outlets. For overseas markets, we are proceeding with preliminary promotional work in Europe and the United States including marketing research, media relationship and launch strategy. In fact, ALLOVE, as a sponsor, has been unveiled in European jewellery industry activities last year, gaining widespread attention and media coverage. Therefore, we are full of confidence on entering the European market, letting more people know the glamor of ALLOVE – Perfection on Sight.